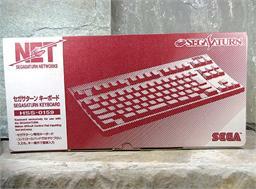 «©NCSX» Brand new and factory boxed Sega Saturn Keyboard for use with any version of the Sega Saturn console hardware. A standard Saturn connector cable is hardwired to the underside of the hardware.. The keyboard may be used with a software title called Habitat II and with the Net Link which allows users to go online with the Saturn. Other than these applications, there isn't much use for the Saturn Keyboard nowadays other than novelty or as a piece of curio from Sega's storied history. NCS' remaining inventory is brand new and factory boxed in the original cardboard containers. The condition of the packaging is in excellent shape with all remaining inventory in like new and undamaged condition. We found a few cases of the keyboards that weren't even opened and the ship date from Tokyo was January 28, 1998 with the original UPS label and pro forma invoices intact. Logitech gets in on the Monster Hunter 3-Tri launch in Japan with a slim and sleek keyboard that measures approximately 12 x 7" in area and fits most human laps.